Art Space Gallery is pleased to present Sketchbooks – Revelation, an exhibition by Elisa Alaluusua, exploring and presenting sketchbooks by four diverse artists: Nigel Hall, Eileen Hogan, Dale Inglis and Michael Sandle. The exhibition is based on in-depth interviews conducted over several years during Alaluusua’s PhD research on sketchbooks. The sketchbook has been at the heart of the creative process for centuries and despite digital advances that may offer alternative ways to develop an idea or capture a fleeting moment, they remain an essential tool. And although Alaluusua has detected a surge of interest in sketchbooks as new books on the subject are published and sketchbooks now regularly find their way into exhibitions, a huge dilemma remains: how can sketchbooks be exhibited and shared with the public? Alaluusua resolves this dilemma by filming and recording individual artists talking about their sketchbook practice and presenting it as a video installation: To date there are 13 individual videos all having the same uniquely constructed format: a continuous sequence of sketchbook pages projected onto a screen or monitor together with a recording of the artist’s response as they leaf through the pages. 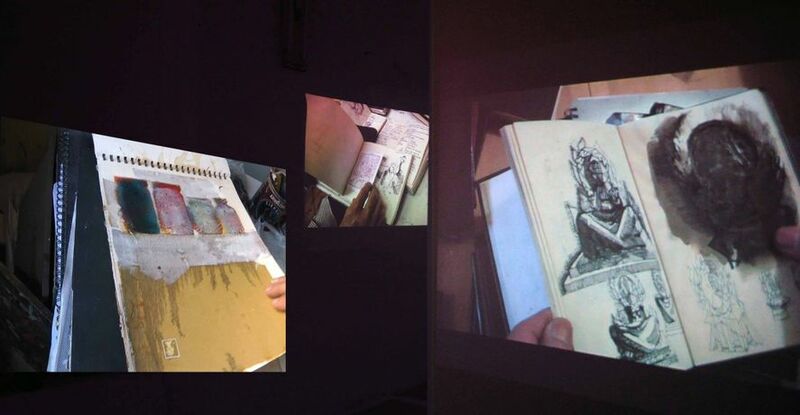 Instead of ‘talking heads’ on a screen, sequences of sketchbook pages are revealed as the viewer listens to the artist’s innermost thoughts. Through this discreet approach, developed over two decades of working with video, Alaluusua has been able to access material previously undisclosed. Art Space Gallery will present a unique version of Alaluusua’s Sketchbooks exhibition. It will concentrate on just four artists and for the first time, each video will be juxtaposed with actual works by the artist involved. InSketchbooks – Revelation creative collaboration has found yet again a new, fresh reincarnation for the project and an invitation for further creative thinking on the theme of sketchbooks. Nigel Hall RA is a sculptor and a draughtsman whose sketchbooks are an essential part of his practice. They are used to record his thoughts daily and to develop ideas for sculptures and drawings. The thought processes and stages of development for every major work can be traced through his sketchbooks. Eileen Hogan’s practice as an artist takes the form of painting, printmaking and book art. Currently she is preparing for a solo exhibition at the Yale Centre for British Art, USA in autumn 2019. Hogan uses her sketchbook daily to make notes in writing, draw her everyday observations and plan bigger works. Sketchbooks represent a very private space for Hogan. Dale Inglis is a London and Sussex - based painter who has been inspired by the river Thames for many years. His work sits comfortably between painting and drawing, as he works on paper, layering his surfaces and often mounting the work on a board. Inglis uses many types of sketchbooks. Michael Sandle RA says that he is an artist who does sculpture. He started his career as a printmaker which shows in his drawings – they are almost hacked onto the pages. Sandle works mainly from imagination and memory although there are drawings from observation that include those made after the sculpture was completed because as he says “it’s hard to let go if you spend years on something”. Kindly supported by the Finnish Institute in London and the Embassy of Finland, London.